The attack on the hospital was carried out a day ago while the car bomb attack was carried out this morning. The militants set a hospital alight in the central Ghor province before slaughtering 35 patients inside. Then, another attack this morning in Kabul targeted a bus carrying employees of the mines and petroleum ministry in Kabul. The blast was so intense that it destroyed nearby shops and three civilian vehicles. 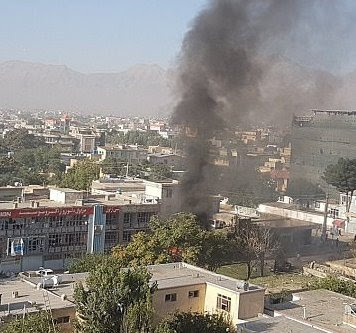 Pictures show a giant cloud of black smoke at the site of the blast, which was near the house of the deputy government Chief Executive Mohammad Mohaqiq. Acting Interior Ministry spokesman Najib Danish said at least 24 people were killed in the car explosion and 40 were wounded but the casualty toll could rise further. Another senior official, speaking on condition of anonymity, said the death toll stood at 35. Taliban claimed responsibility for the attack. In a tweet, Taliban spokesman Zabihullah Mujahid, said 37 "intelligence workers" had been killed. He further disclosed that two buses had been targeted for the attack and had been under surveillance for two months. 0 Response to "70 Killed In Afghanistan As Taliban Launch Suicide Car Bomb Attack And Slaughter Patients Inside A Burning Hospital"